OTTAWA — An all-party committee of elected MPs planned a closed-door meeting with a delegation of Chinese politicians and diplomats this week, but abruptly cancelled it on Wednesday. A former Canadian ambassador to China said the meeting was a bad idea in the first place because holding it in-camera meant a lost opportunity for Canada to show Beijing how a democracy really works. The meeting was cancelled one day after Canada's new top spy told a business audience that interference by hostile states has now become a greater threat to Canadian national security than terrorism. The Commons foreign-affairs committee had planned to meet in-camera for one hour on Thursday with Lu Shaye, Beijing's ambassador to Canada, and four visiting members of the National People's Congress of China. The congress is China's legislature, consisting of nearly 3,000 deputies. William Spotton, a spokesman for committee chair Michael Levitt, a Toronto Liberal, said Wednesday that the "Chinese cancelled that meeting for tomorrow" but he said he did not know the reason. Asked why the meeting was initially closed, he replied: "they've cancelled so there's nothing really to comment on." David Mulroney, who has served as a Canadian ambassador to China as well as a national-security adviser, said it was a "dumb" idea for elected MPs to agree in the first place to meet in private with the Chinese delegation. "I find this surprising and unfortunate," said Mulroney. "Parliament should be taking every opportunity to show how a democracy works. Instead, it's being more Chinese than the Chinese, effectively shielding the ambassador from public and, possibly, critical scrutiny." Canada and China had a diplomatic dust-up last month when the foreign ministry in Beijing criticized the Canadian ambassador for spearheading a letter-writing effort by 14 fellow envoys. They expressed concern over the jailing of hundreds of thousands of its Muslim minorities in re-education camps in the northwestern region of Xinjiang. 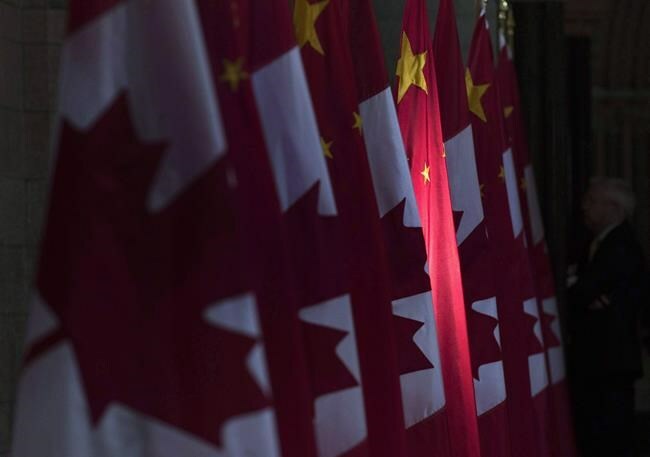 Beijing is also unhappy with the Liberal government for a decision earlier this year that cited national-security concerns to block the $1.5-billion purchase of the Canadian construction giant Aecon by a Chinese state-owned company. Mulroney, who served as Canada's envoy to China from 2009 to 2012, has been a vocal critic of China's efforts to meddle in the affairs of foreign countries, including Canada's. "This is a multi-party briefing, not a negotiating session. We should be wary of creating another channel for the Chinese, who are skilled practitioners of divide and conquer," he said. On Tuesday, David Vigneault, the new head of the Canadian Security Intelligence Service, told the Economic Club of Canada in a speech that the "corporate secrets" and "intellectual property" of Canadian companies are being targeted by "hostile foreign intelligence services." He said those state actors are now a greater threat to national security than terrorists. "The national security community — of which I am part — and the business community — of which you are part — have a shared interest in raising public awareness of the scope and nature of state-sponsored espionage against Canada, and of its potential effect on our economic growth and ability to innovate," Vigneault said in his speech. That followed a 2016 warning by CSIS that Russia and China were targeting Canadian government officials and systems, as well as classified information and advanced technology. On Wednesday morning, the foreign-affairs committee's website showed that an in-camera meeting with Lu and the four visiting Chinese deputies was to take place at 10 a.m. Thursday in a federal government building in the parliamentary precinct. The committee's website listed the meeting as "In Camera — without audio recording" as of late Wednesday morning. By early Wednesday afternoon, the meeting status was updated to "cancelled." Parliamentary committees are allowed to meet in-camera to discuss draft reports or other administrative or planning matters. They can also meet in-camera if their chairs and their members agree to do so. The same committee heard open testimony from two Somali government officials on Wednesday, and recently hosted an open session with a visiting Finnish delegation. Erin O'Toole, the Conservative vice-chair of the committee, said it is "not irregular" for visiting delegations to be heard in-camera. "I have concerns today about discussions about 'in-camera, no recordings,' these sorts of things," said O'Toole, but he added he didn't know who made the request or why. O'Toole said the only time he could recall an in-camera meeting not being recorded was during a discussion about foreign hostages, so witnesses felt at ease sharing sensitive information with MPs.